Crown Publishing provided me a copy of this eGalley, via NetGalley, for the purposes of reading and reviewing it. Although it was provided to me at no cost, I am under no obligation to provide a positive review. Before I get started, let me say this is an epic book. It’s 576 pages of (as my sixteen year old son would say) “beefy” reading. The amount of research required to produce this tome must have been extensive, and for that I commend Carroll. Unfortunately, I could only read 10-20 pages at a time before getting bogged down in details and having to set it aside. 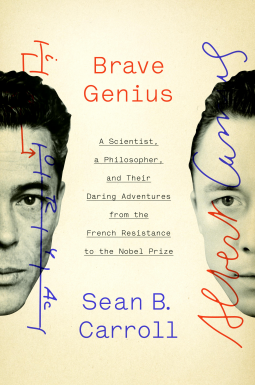 On the surface, this looks like a fascinating story: two famous Frenchman, Albert Camus and Jacques Monod, have their paths cross during the French Resistance against the Nazi Germany regime of World War II. Each has a completely different background and career, and yet they strike up a friendship that lasts well beyond World War II until Camus’s untimely death in 1960. While I had only a passing familiarity with Monod prior to reading this book, I have been a fan of Camus’s writing for years. It was fascinating to read the path each person took on their way to receiving a Nobel Prize in their respective fields. My biggest complaint about this book is it spends far too much time on the details surrounding the lives of Camus and Monod. Sure, the strategies the Nazis employed for invading France are fascinating and set in motion the Resistance effort that led to Camus and Monod meeting, but the details are too far removed from the actions of the men themselves. Don’t get me wrong, I am fascinated with World War II and Nazi Germany in particular, but that’s not what I was hoping for or expecting from this book. The same thing applies later when the author spends a significant amount of time describing the research leading up to Monod’s Nobel Prize. You can see that Carroll’s training as a biologist shines through, as he is obviously passionate about Monod and his work. But it does seem to become unwieldy at times. In a nutshell, it seems this book doesn’t really have a clearly defined identity. Is it a biography of Camus and Monod? Historical text? Biology text? While Carroll’s details and research are undoubtedly meticulous, the book could have been cut by 150 or more pages and still be an outstanding recording of these men’s lives. As it is, it gets bogged down under its own weight.